We are proud to provide dental bridges to patients who may be missing one or several teeth, or to restore strength and the general appearance of your smile. A dentist is only as good as thier lab and we choose only the best labs. Now have the ability to offer same-day crowns! At Crabtree Valley Dental in Raleigh, we are proud to provide Dental Bridges to patients who may be missing one or several teeth. If you have lost teeth due to an accident or decay, bridges are an effective way to redistribute biting pressure, while also providing significant cosmetic benefits. When missing teeth are not replaced, teeth surrounding the gap tend to shift and become more prone to decay and gum disease. The bridge procedure takes place over two visits to Crabtree Valley Dental. The process begins by anesthetizing the patient to ensure a comfortable experience. The teeth adjacent to the missing tooth are prepped for crowns. These are called abutment teeth and hold the bridge in place. The abutment teeth are linked together by the part of the bridge that replaces the missing tooth, called the pontic. Next, an impression is taken and sent to the lab while we have the patient in a temporary bridge for 2-3 weeks. On the second visit, we remove the temporary bridge and the permanent bridge is set. We confirm optimal fit, feel, function, and esthetics prior to cementing the bridge in place. A very important consideration with bridges is the color decision. Crabtree Valley Dental dentists are skilled at providing patients with the guidance they need to make their best choice. It’s important to balance the desire to have the “whitest teeth possible,” with a shade that complements the existing teeth in the mouth. Shade charts and factors such as the patient’s complexion, physical appearance, hair and eye color and the potential for bleaching in the future, should all be considered in making the final color choice. Bridges offer considerable health and cosmetic value for individuals. If you believe a bridge can be of benefit to you or a family member, please schedule an appointment today by calling Crabtree Valley Dental in Raleigh at 919-985-7300. Crabtree Valley Dental now offers same-day crowns! Crowns — referred to by some people as caps — are dental restorations that cover the entire visible surface of a tooth. They are usually used to restore strength, shape and/or size, or the general appearance of a tooth. Crowns can be made from a variety of materials including metal, porcelain or ceramics, porcelain fused to metal. Each option has its pros and cons, based on factors such as position of the tooth and anticipated amount of wear and tear. 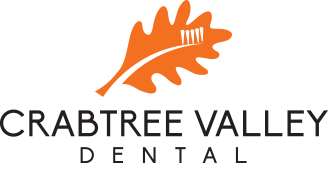 The dentists atCrabtree Valley Dental review the choices with our patients and help them choose the best option for their specific situation. The crown procedure takes place over two visits to our office Crabtree Valley Dental in Raleigh, conveniently located just footsteps away from Crabtree Valley Mall. The process begins by anesthetizing the patient and taking an impression of the tooth to make a temporary crown. The tooth is prepared for a crown, then a final impression is taken and sent to the lab. A temporary crown is made fo the patients during the time it takes the lab to make the permanent crown. At the second appointment, the temporary crown is removed, and then the crown is set. We confirm optimal fit, feel, function prior to cementing the permanent crown in place. If you believe that you or a family member would benefit from a crown, please contact Raleigh’s Crabtree Valley Dental for an appointment at 919-985-7300.